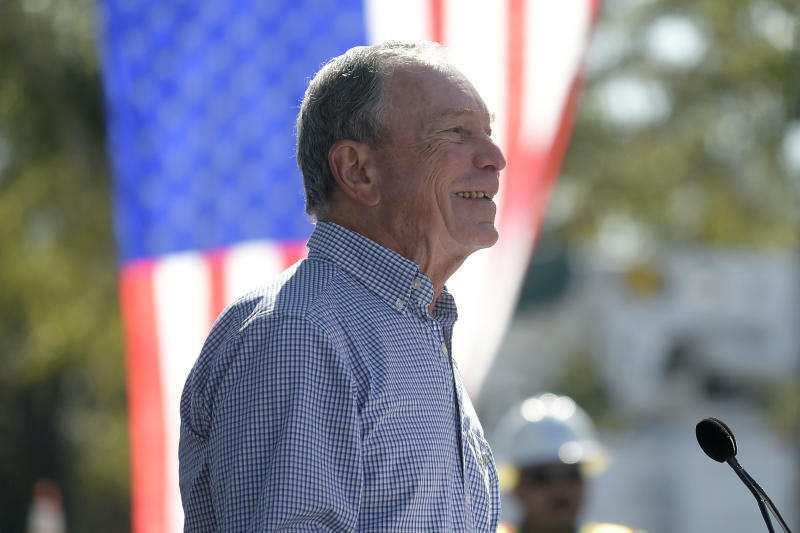 ORLANDO, Fla. (AP) — This should be Michael Bloomberg's moment. No presidential prospect has done more to confront climate change than the billionaire Democrat, who measures his progress in the metric tons of carbon emissions he's helped eliminate. But as climate change surges to forefront of the 2020 Democratic primary, no issue better illustrates Bloomberg's political challenge. A onetime Republican, the pragmatic former New York mayor is struggling to find his place among the increasingly bold ambitions of his adopted political party. Virtually every top Democratic White House contender embraced the so-called Green New Deal immediately after it was released last week. The nonbinding resolution outlined ambitious plans to cut all greenhouse gas emissions to net zero over 10 years while instituting massive investments in wind and solar production, energy-efficient buildings and high-speed rail that could make air travel obsolete. Bloomberg was not among the cheerleaders. He welcomed more focus on climate change, but questioned the ambitious plan's feasibility. "I'm focused on what are we going to do tomorrow. I'm not a legislator. I'm an executive. That means doing things and not just talking about them," Bloomberg said in an interview with The Associated Press. "Some of the things they talk about are very long term. Decades. You're not going to find out whether that's achievable for decades," he continued. "If you say you're going to do something, I want to know when, and how, and who's going to pay for it. ... Legislators don't work at that level." Democratic primary voters might not reward that approach. Climate change is a key issue for the party's base, who want dramatic action to counter President Donald Trump's moves to eliminate Obama-era environmental safeguards and step away from the Paris climate agreement. AP VoteCast, a nationwide survey of the American electorate, found that 92 percent of people who voted for Democrats in the 2018 midterms said they were at least somewhat concerned about climate change. Seventy percent said they were very concerned. That helps explain why many White House contenders leapt at the opportunity to endorse the sweeping Green New Deal released by self-described democratic socialist, Rep. Alexandria Ocasio-Cortez, D-N.Y.
Massachusetts Sen. Elizabeth Warren, New Jersey Sen. Cory Booker and California Sen. Kamala Harris publicly endorsed the Green New Deal hours after it was released. Many indicated they'd endorse some form of the plan even before the details were known. Republicans seized on the measure as an example of the Democratic Party's sharp lurch leftward. Many Democrats held it up as the kind of big, bold ideas that are necessary to combat the Trump administration. "Everybody on the Democratic side is going to realize you've got no chance being a climate moderate," said billionaire Democratic activist Tom Steyer, who partnered with Bloomberg on climate change recent in recent years. "He's going to be running as a moderate Democrat. I think that's who he actually is," Steyer added. "But I don't think you can cast dispersions on his climate bona fides, because they really exist." Indeed, Bloomberg has helped shutter 282 coal plants in the United States and organized a coalition of American cities on track to cut 75 million metric tons of carbon emissions by 2025. Reflecting the dramatic action, the United Nations named him a special envoy for climate action last year. He has committed $218 million to clean-energy work since 2011, according to his foundation. He is the biggest individual donor in Sierra Club history, having spent $168 million since 2011 to help fund the organization's anti-coal campaign. That investment includes $64 million announced in the wake of Trump's election, when Bloomberg doubled down on the program through 2020. He donated another $50 million last year to address coal pollution internationally. After Trump withdrew the United States from the Paris climate agreement in 2017, Bloomberg and former California Gov. Jerry Brown launched a massive push to encourage cities, businesses and nonprofits to maintain aggressive carbon emission reduction targets. To date, Bloomberg's foundation predicts the effort puts the United States "within spitting distance" of the Paris carbon targets, despite the federal government's unwillingness to participate. Bloomberg's allies on climate change include former longtime Sierra Club executive director Carl Pope, who calls Bloomberg "clearly the greatest environmental innovator being talked about for president for 2020." 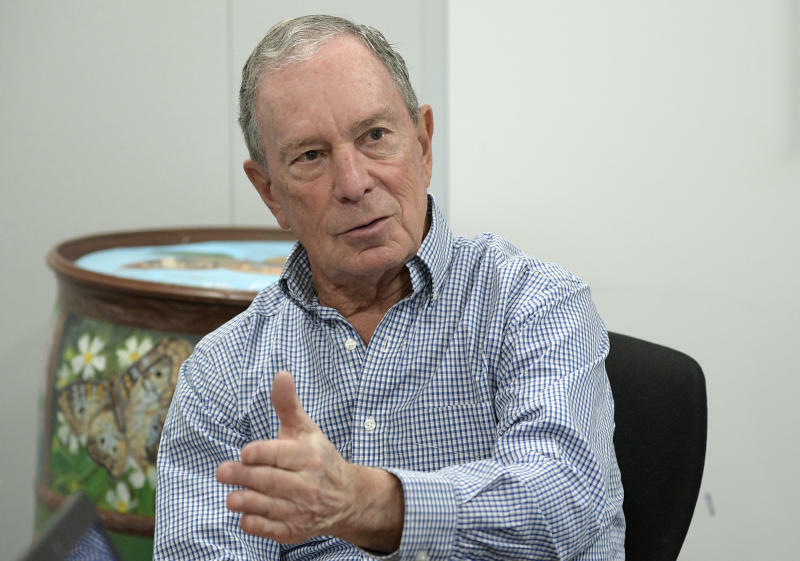 Bloomberg told the AP he would announce his 2020 intentions by the end of the month. Climate change, his aides report, would stand as a pillar of his presidential campaign should he run given his extraordinary record. But with vocal critics on the right and left, it's unclear whether voters will reward him, especially with alternatives in the race. Washington Gov. Jay Inslee, a potential Democratic contender, has already made climate the early focus of his voter outreach. Vermont Sen. Bernie Sanders embraced environmental justice as a priority during his first campaign and promises to go further should he run again. "Bloomberg's reputation as a climate warrior is a bit overblown," said Mitch Jones, climate and energy program director at the Food & Water Action, an organization that fights corporate influence in environmental issues. Jones called Bloomberg "a pro-fracking, pro-pipeline, pro-nuclear billionaire who favors half measures and false solutions because he's more interested in protecting his friends in the C Suite than he is in stopping climate change." Bloomberg acknowledged that he supports gas and oil pipelines. And he continues to support the production of natural gas and ethanol, both fossil fuels that have drawn the ire of modern-day environmental activists. But such fuels, he said, should be phased out over time. He laughed when asked about the criticism from the left. "If we haven't pleased people on climate, I don't know what you could do for them," Bloomberg said. "You have to have a practical aspect. Look, nobody is going to go to the endgame directly." After the interview, Bloomberg toured a floating solar power project on a pond outside the Orlando, Florida, public utilities commission — a project that he helped pay for. He shrugged off a reporter's question about the Green New Deal, focusing instead on his partnerships with 25 U.S. cities to reduce 40 metric tons of carbon emissions by 2025. Asked whether a presidential run might be the best way to promote his vision for America, Bloomberg chuckled. "I'm not sure everybody would agree with that," he said. "I'd look at it differently if I thought everybody did." Associated Press writer Emily Swanson in Washington contributed to this report.